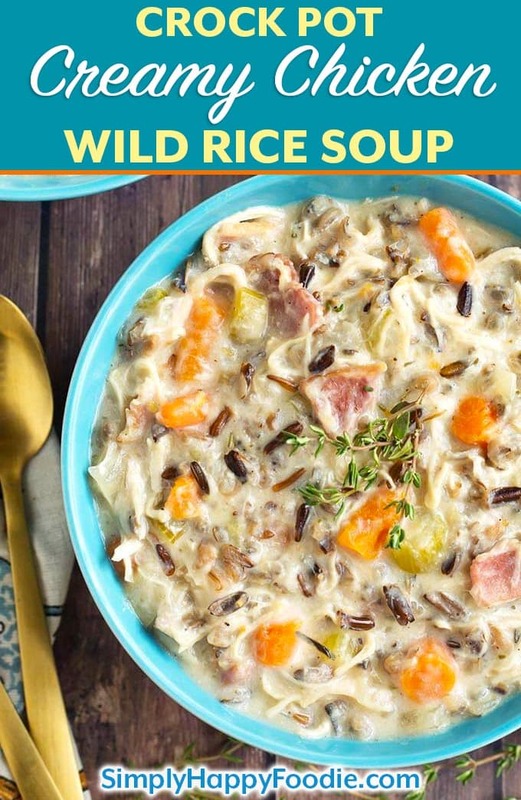 Crock Pot Creamy Chicken Wild Rice Soup is delicious, thick, rich, and so simple to make! 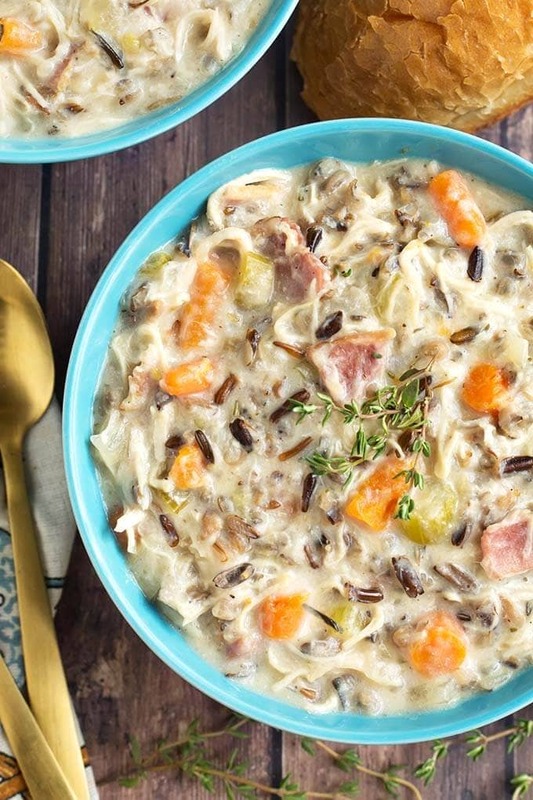 Slow cooker creamy chicken wild rice soup is a hearty one pot meal that is perfect for Fall. My whole family loves this soup! Oh for the love of soup! I definitely ramp up my soup making when Mother Earth leans into Autumn! It’s an uncomplicated delicious meal that is great alone, or with crusty bread, or any number of add-ins. Depending on the soup. Since the Crock-Pot® came into popularity when I was a child, my home has never been without one! I still have one that has a mauve colored crock from the ’80’s! Why did we think mauve was so great? Oh well, I survived that crazy fun decade! Getting back to soup, I want to tell you about this recipe, because it’s really yummy. 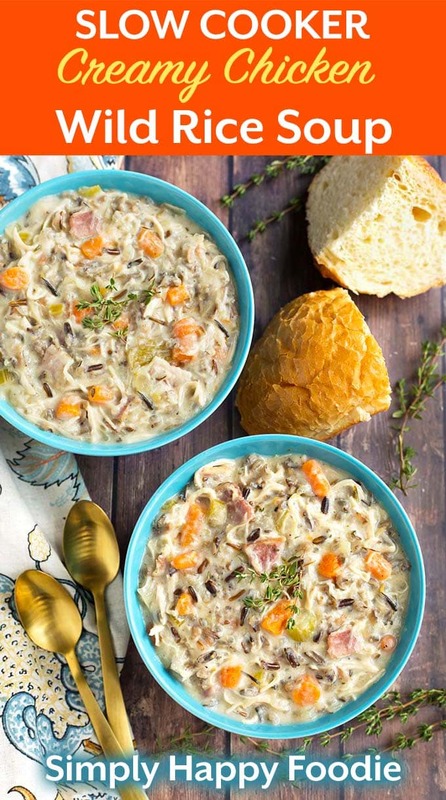 Crock Pot Creamy Chicken Wild Rice Soup is a beautiful thing. It has a lot going on with a mirepoix (onion, celery, carrots), garlic, herbs, tender chicken breasts, wild rice, and a roux to thicken it all up. There’s nothing to precook, and the roux at the end is as easy as melting butter in a sauce pan and stirring! When you buy your wild rice, make sure it is actually 100% wild rice and not a blend. This is a thick soup and the blends have other rices in them that will break down with the long cook time. This will make the soup gummy and too thick. You can find real wild rice at Trader Joe’s, Amazon, and sometimes in a regular grocery store (this is one of the very few ingredients from my recipes that you might need to look for outside the typical grocery store. I get mine online or at Trader Joe’s. It will vary, depending on where you live. 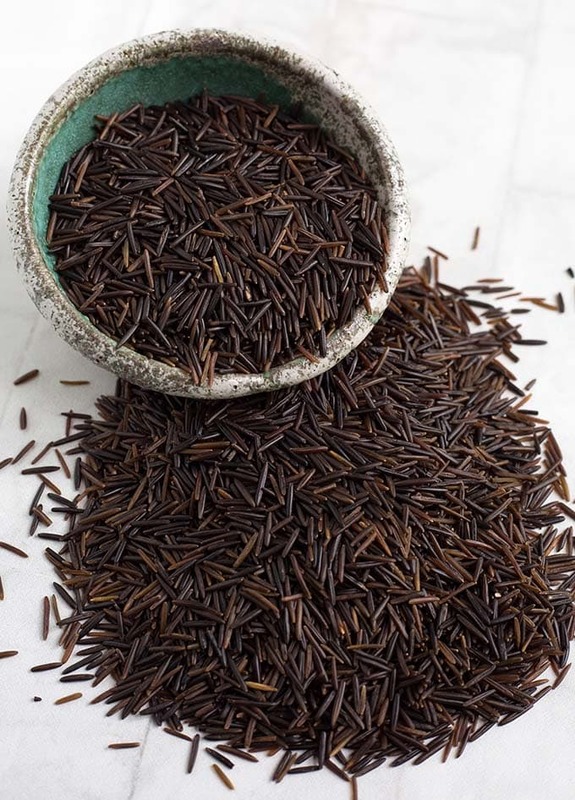 Wild rice is a rich dark brown color, and has a fragrance that is like tea. At least to me it smells like tea! This photo is of a brand from Minnesota (Wild rice is their State Grain). When wild rice cooks it pops open and becomes soft and slightly chewy. It’s a very appealing texture! 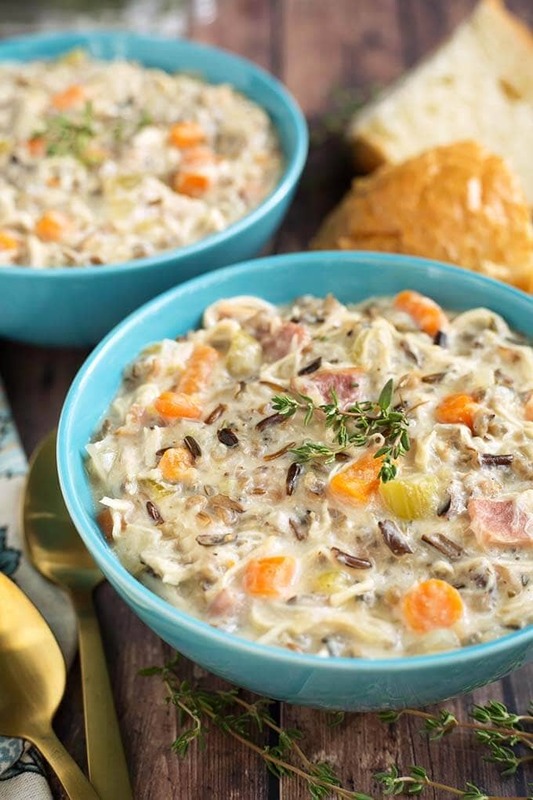 It also helps a bit to thicken this Crock Pot Creamy Chicken Wild Rice Soup. Thank you for visiting my blog today! I work very hard to produce recipes that will be delicious and easy to prepare. My mission is to give you something to make for your family/friends/loved ones that you can be proud to serve to them. 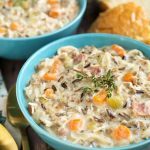 Crock Pot Creamy Chicken Wild Rice Soup is delicious, thick, rich, and so simple to make! 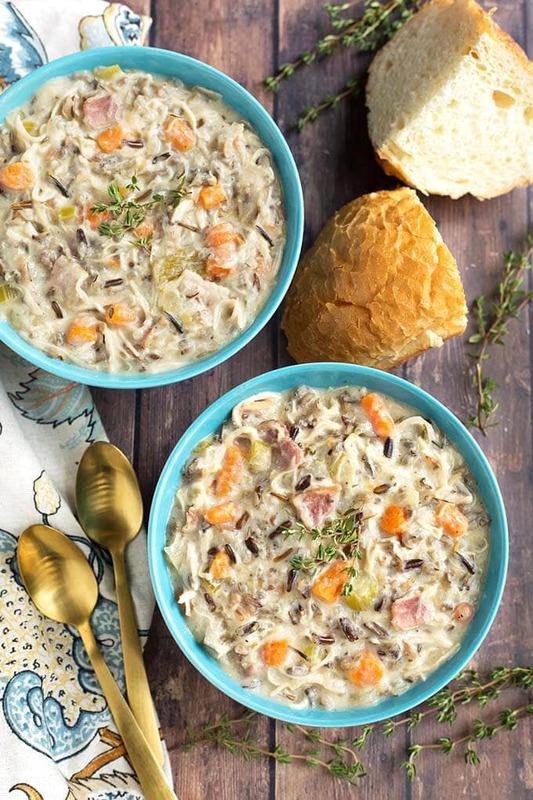 Slow cooker creamy chicken wild rice soup is a hearty one pot meal that is perfect for Fall. Add all ingredients except the butter, flour, 1/2 tsp salt, and milk to the crock pot and stir, making sure the chicken breasts are not overlapping each other. Cook for 7 hours on Low or 4 hours on High. When finished cooking, remove the chicken, shred it, and add back into the soup. Replace lid. Thicken the soup. Leave the lid on the crock pot to keep soup as hot as possible. In a saucepan, melt the butter on med-high heat. Whisk in the flour and salt, and let it cook for a few minutes while continuing to whisk. This gets the raw taste out of the flour. Gradually whisk in the milk. The mixture will become quite thick. Keep whisking in the milk until all of it is incorporated and there are no lumps. You want it just loose enough to come out of the saucepan easily. If too thick, add just a bit more milk. Stir the mixture into the hot soup. Mix very well and put the lid back on the crock pot and let the hot soup thicken. Stir. Taste and add more salt if needed. Serve with some crusty bread. *If you don't have rosemary or thyme, use 3/4 tsp of poultry seasoning. **If the soup is too thick when finished, you can stir in more broth to loosen it up. This is supposed to be thick and hearty, and the result you get will vary by the brand and amount of the ingredients you use. If you ever have a question, compliment, or even a suggestion, please leave me a comment below and I will see it. If You liked the recipe you tried, please leave a comment with a star rating. This also helps others decide if they want to make it! This was so good! I liked how thick it came out and it was delicious. My husband told me to put this one on the rotation!